This is where I was going to tell you about our train ride from D.C. to New York. I even wrote a post about how excited I was for my first time riding the rails. Unfortunately, while I was writing that post, I missed the 14 day advance cutoff for discount train tickets and the price doubled on me (There's probably a lesson about prioritizing there somewhere, but you know I didn't learn it.). While I was willing to give the train a shot at $37 per person, $80 was more than we paid to fly across the country, so we decided to travel to New York on the BoltBus. Now to be honest, I could have written the same post about bus travel that I wrote about train travel (minus the whole giraffe thing). 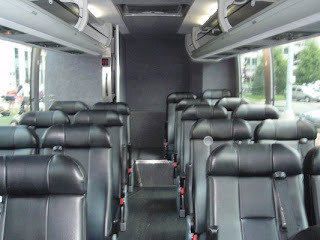 I've never traveled by bus, so when we decided to switch to the BoltBus, we were starting from scratch. I visited their website and found that they have a free frequent rider club which lets you board the bus in boarding group "A" (it's kind of like the Southwest Airlines boarding system), so I signed us all up for that. Then I booked us five one way tickets to New York for $17 each. The train may have appealed to my heart, but the bus appealed to my wallet, and that's a pretty tough battle for the train to win (although obviously I didn't use the same criteria when getting married). The BoltBus depot for D.C. is at Union Station, only a couple of blocks away from the Hyatt Capitol Hill where we were staying. It was simple enough to walk to the station, but once we got there we got a little confused finding the BoltBus location as it's actually on the fourth floor of this three story building. Eventually we took enough escalators to get up to it, and we arrived about 15 minutes before our scheduled departure, which apparently is the bus equivalent of getting to the airport four hours early. We were the first people to arrive for the "A" boarding group, there was nobody there for "B", and about five people were in line for "C". I'm thinking this bus travel thing might suit my lack of punctuality just fine. Once the bus arrived, I decided to demonstrate my rookie status at bus travel by trying to carry on most of our bags. The storage space on a BoltBus is nowhere near comparable to an airplane, so you might want to consider putting anything bigger than a squishy duffel bag underneath. Fortunately I ended up with an empty seat beside me (See, it pays to look scary!) so we avoided having to take bags back off the bus and put them underneath. Without bags taking up the space though, there was lots of leg room and the seats were quite comfy. So how did we entertain ourselves on the five hour ride? Well the BoltBus does have Wi-Fi, but it's pretty spotty, so while you can probably make a quick Facebook update, forget about trying to stream anything from Netflix. You'd better bring your own entertainment with you, or you can do what I did and listen to the guy behind me try to impress the girl he sat down next to. I've never heard a woman mention the word "fiancé" and "committed relationship" so often, yet for some reason this guy insisted on pressing on with his story about how he auditioned for a Jersey Shore spin-off. The poor girl might have been cursing her luck, but I was fully entertained right up until we made our one scheduled stop at a food court in Delaware, and the girl took the opportunity to switch seats. Back to the iPad for the last couple hours, but Cowboys vs. Aliens was nowhere near as interesting. 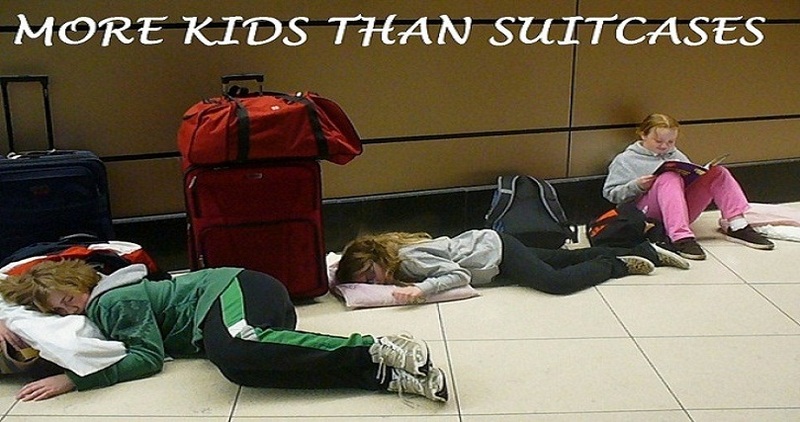 Eventually we rolled in to the Port Authority in New York City. Now while the Port Authority wouldn't be my first choice of places to be dropped off in the middle of the night, during the daytime it's just too busy to be scary. It was also just a half block from the hotel we were staying at, so for convenient locations, the BoltBus was absolutely perfect. 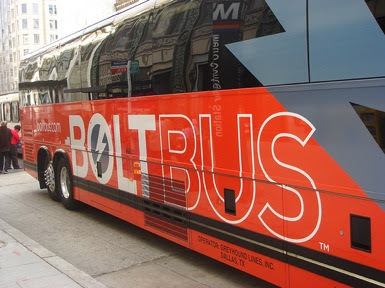 Actually the entire BoltBus experience was convenient, comfortable, and ridiculously affordable. I still want to try the train one day, but unless it's an absolutely amazing experience (complete with giraffes and chase scenes), I'll probably go back to riding the BoltBus. Maybe next time I can sit in front of somebody who tried out for Real Housewives of Orange County. Those are some stories I'd love to hear.